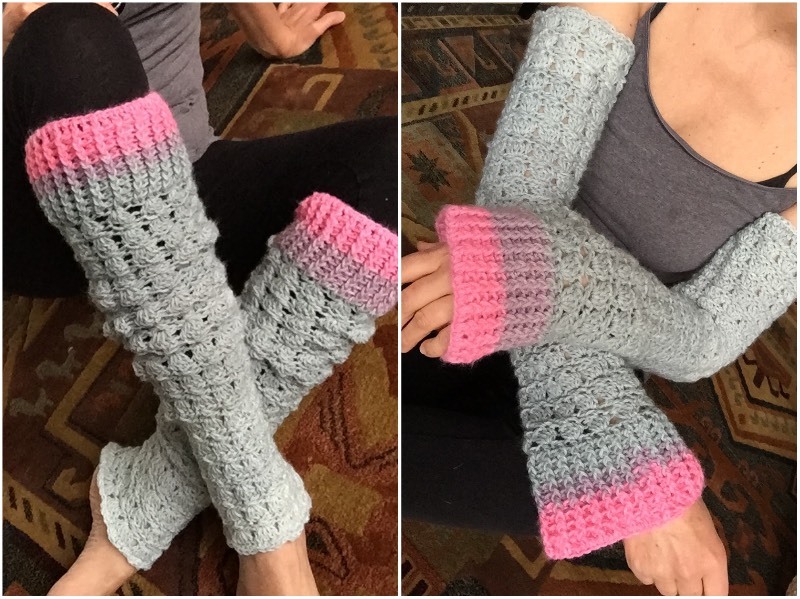 I designed these "Sweet Taffy Legwarmers" with ballerinas on my mind. I pictured them wearing crocheted legwarmers as they practice their tendu, plie or pirouette. But let's not limit ourselves to who can wear these legwarmers and how. People that feel cold in the fall, winter, and spring (such as myself) can enjoy crocheted "legwarmers", or wear these as "armwarmers 😊 ". This pattern is NOT for utter beginners. 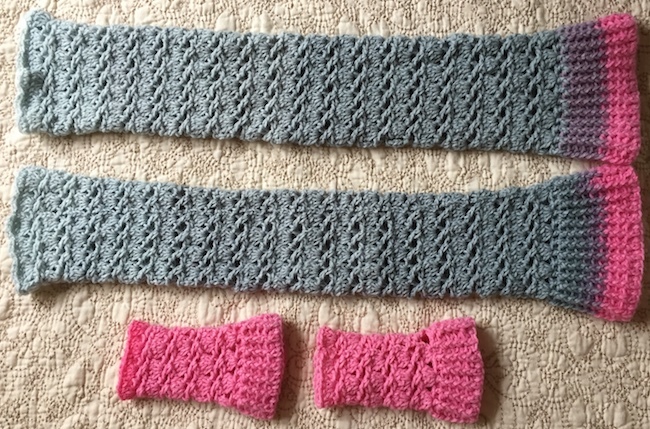 However, if you are a little skilled and adventurous crocheter and if you watch my video, you may be able to work on this project even if you don't have a whole lot of experience. The video is so detailed that a few less experienced crocheters may find it helpful and embrace it as a push forward to try something new. Below you will find two patterns - one for very slim legs (mine, LOL) and one for a newborn baby. However, you can make these for anyone. If it comes to a width, first, you should crochet enough chain stitches to wrap around the widest area of your leg (upper part, or a calf). Then count them and make sure the total number is a multiple of 4 (such as 24, 36, 48, 56, 60, etc.) For example, if you make a chain of 62 sts than your nearest number to work with would be 60 sts. It is better to make it one or two stitches smaller because the legwarmers will stretch. I started legwarmers for myself with 50 stitches, but it would have been better to make 48 chain stitches to start with. 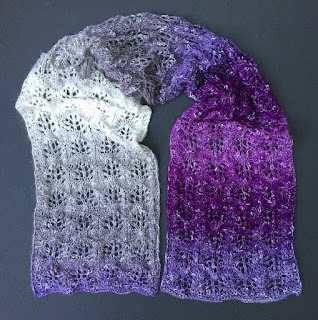 It would eliminate the extra 2 stitches I had to "get rid of" when I started the design after the ribbing. 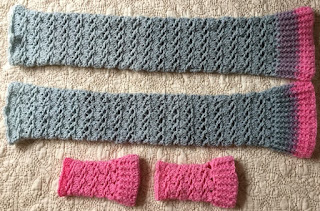 I started the legwarmers for a newborn baby with 30 sts. However, to make it easier for myself I should have started it with 28 sts (for slimmer legs), or with 32 sts (for chubbier legs). Here too, I had to eliminate 2 sts when I started to crochet the design part. I will write the Newborn pattern with 28 stitches, to make it easier on you. If you want to make it for an older child, then just add one or more extra 4-chain repeats. 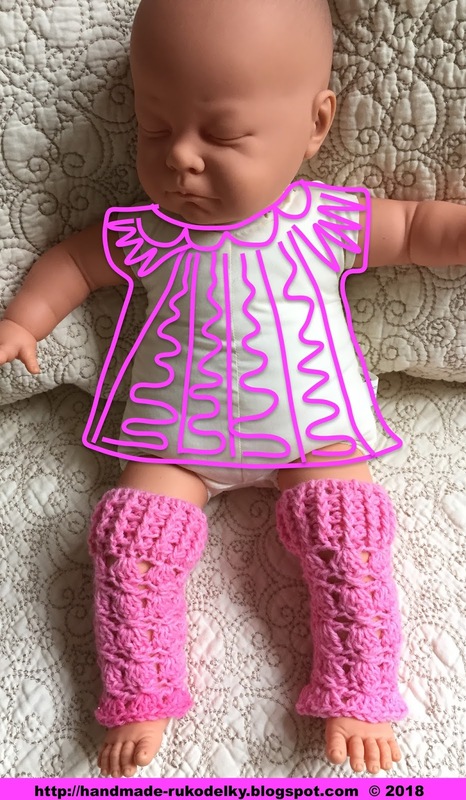 For the length do this: measure a distance between the upper part and the ankle area, and crochet until you reach the desired length. 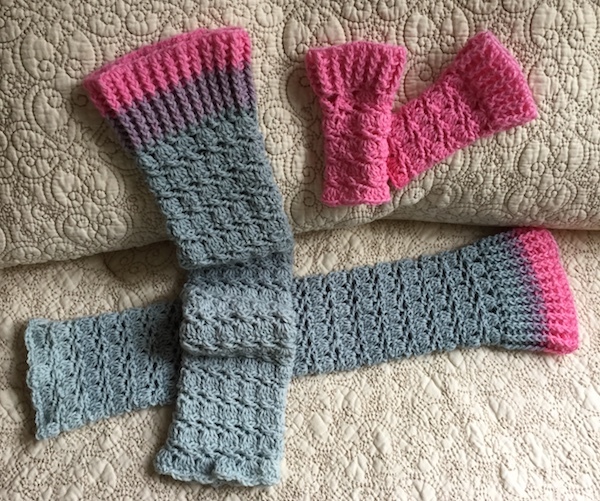 If you would like your legwarmers to have a gathered look, then I would make few extra rows. Good luck and enjoy. Repeat Rnd 13 & 15 as many times as needed. Repeat Rnd 8 & 9 as 2x (or as many times as needed). Rnd 1 slip stitch into ch2 space; then start your first cluster with ch3, then 4 dc in the same base as ch3 (5dc-cluster), *[skip 3 sts, 4 dc in 4th ch st, skip 3 sts, 4 dc in 4th ch st]* - alternate these 4- and 5-dc clusters to end (you will finish with 5-dc cluster); join (total 7 "dc-clusters") - weave in all ends.